CFL double-deck driving trailer no. 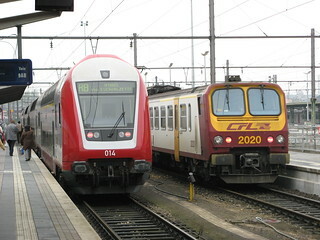 014 with série 2000 EMU no. 2020 at Luxembourg City, 28th September 2007. The double-deck unit is in push-pull mode on an Athus service, being powered by a CFL série 4000 locomotive.